Samsung, as most of us guessed already, introduced its new J Series in India with the launch of Galaxy J5 and Galaxy J7 on Thursday. The smartphones, which have been available in China since last month, fit into the mid-range segment based on their low prices, but offer impressive specifications and features. 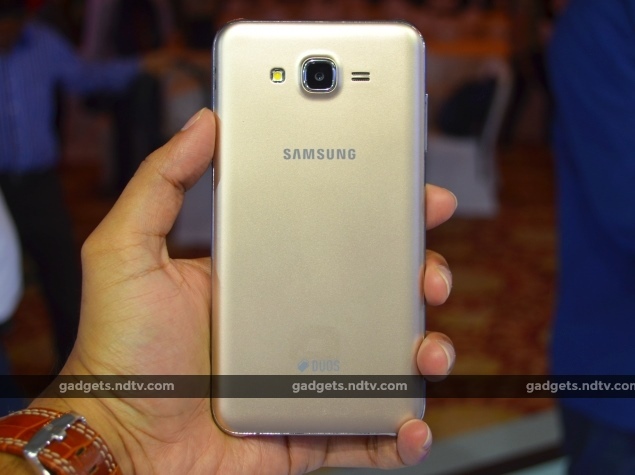 While the smaller Samsung Galaxy J5 is priced at Rs. 11,999, its larger sibling, the Galaxy J7, will set you back by Rs. 14,999. Both are Flipkart exclusives for now and are available to pre-order, but will ship on July 24. The two new phones are also positioned by Samsung as affordable devices for gamers as they can potentially deliver smooth online gaming experiences using 4G LTE connectivity. Notably however, the models launched do not support TDD-LTE Band 40 (2300MHz) for 4G LTE in India, and only the FDD-LTE Band 3 (1800MHz) that has yet to see a rollout in the country. Update: While the specifications initially provided by Samsung India did not mention support for 2300MHz TDD-LTE Band 40, Samsung has confirmed to NDTV Gadgets that the Galaxy J5 and Galaxy J7 smartphones do indeed support this band as well as 1800MHz FDD-LTE Band 3. Airtel uses Band 40 for its 4G services in India right now, and other operators are lining up to launch 4G services using Band 3. Talking about 4G LTE, which is still being tested in some places and is yet to reach many others, Samsung has not only partnered with Flipkart for as an exclusive retailer, but has also teamed-up with Airtel. As a part of the collaboration, Galaxy J5 and Galaxy J7 users would receive double Airtel 4G LTE data along with unlimited music downloads worth Rs. 549 for six months using the Wynk Music app. Early buyers can also grab the flip wallet cover worth Rs. 999 for Rs. 199. The company has also collaborated with the popular video game company Gameloft to offer Rs. 3,200 worth of in-game credits for Galaxy J users. 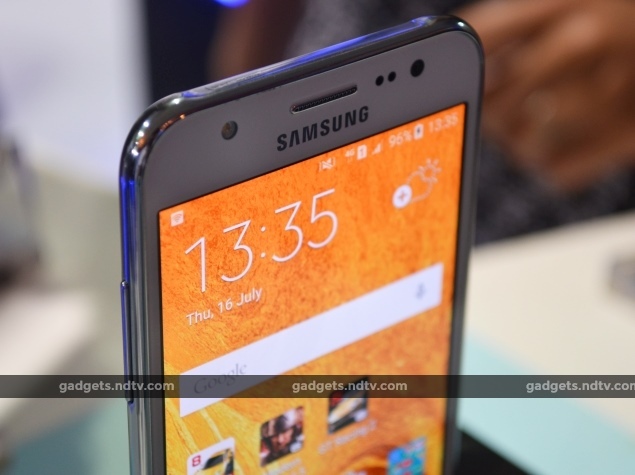 With the introduction of its Galaxy J5 and Galaxy J7, Samsung has in a way replied to some of the heavy hitters in the market which are dominating the mid-range today. The two phones go up against the Xiaomi Mi 4i, Motorola Moto G (Gen 2), Sony Xperia E 4G and many others. 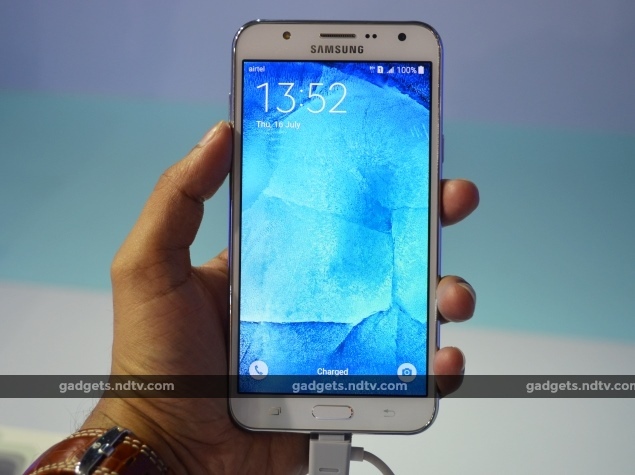 Looking at the specifications, the Galaxy J handsets seem to have raised the bar. 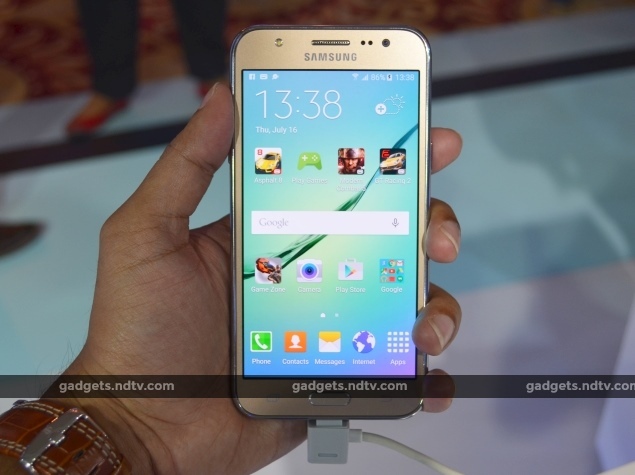 The two new Samsung smartphones both run Android 5.1.1 but have a few differences. The Samsung Galaxy J5 features a 5-inch Super Amoled HD display; a 1.2GHz quad-core Snapdragon 410 SoC; 1.5GB of RAM; 8GB of built-in storage; a 13-megapixel rear autofocus camera; a 5-megapixel front camera, and a 2,600mAh battery. As for the Samsung Galaxy J7, it features a 5.5-inch screen; 16GB of inbuilt storage, a 1.5GHz octa-core Exynos 7580 SoC, and a 3,000mAh battery. Both handsets' inbuilt storage can be expanded via microSD card (up to 128GB). It is worth noting that the China versions of the two Galaxy J smartphones differ slightly from those launched in India. The China versions have TFT screens instead of Super Amoled. The Galaxy J5 features 16GB of inbuilt storage instead of 8GB and the Galaxy J7 is powered by a Qualcomm Snapdragon 615 rather than the Exynos 7580. Don't get your hopes up too high in terms of appearances, as these two new phones look more or less like every other Galaxy smartphone in the market. Both sport anodised bodies, shiny cheap-looking faux-metal side bezels, and the same monotonous overall design profile. The Galaxy J7 in particular felt a lot like the Samsung Galaxy Mega 6.3, which launched back in 2013. The handset slipped out of our hands twice in a short period, but we managed to catch it. The Galaxy J5 on the other hand was easier to hold due to its compact size, which gives a better grip and makes it easier to reach all corners of the screen. Nonetheless, the gold versions of both looked pretty good. Users who own a recent Samsung smartphone won't find much that is new in the user interfaces of the Galaxy J5 and Galaxy J7. What might appeal to them are the minor changes that come natively with Android 5.1.1 Lollipop and would be present in other handsets as well that are running the same OS version. For pure Android users, the TouchWiz UI might feel more cluttered. The overall interface, however, is snappy and doesn't make the smartphones feel slow. Looking at the prices, the use of HD (720x1280-pixel) resolution screens was pretty much expected from Samsung. Both, the 5-inch screen of the Galaxy J5 and the 5.5-inch screen of the Galaxy J7 looked saturated and more vibrant than the screens of smartphones from other brands in the same segment. While the processors in the two models are different, the end users will probably not perceive any difference between the two while using the phones. However, theoretically, the 64-bit octa-core Exynos 7580 in the Galaxy J7 should edge out the 64-bit quad-core Snapdragon 410 in the Galaxy J5. As for storage, the Galaxy J5 on display at the event reported around 4.6GB free out of 8GB, and the Galaxy J7 showed roughly 11.5GB of 16GB free for users. MicroSD cards of up to 128GB can be used, so customers might not need to consider the Galaxy J5's lower amount of inbuilt storage a limitation. The main differences between the two models are the larger display and the slightly better battery life of the Galaxy J7. The cameras of both phones impressed us. The 13-megapixel rear camera with f/1.9 aperture seemed to work well in our limited time at the launch event. The camera app opens within a second of double-tapping the home button. Menus and options don't clutter up the screen when capturing images, but are easily accessible with a couple of taps. While the Galaxy J5 offers seven modes, namely Auto, Pro, Panorama, Continuous Shot, Beauty Face, Sound & Shot, and Sports; the Galaxy J7 comes with one additional mode: HDR. Switching to the front-facing camera, the handsets show another set of modes including a Wide-Selfie Shot. There are also front-facing flashes on both phones. Only the Continuous Mode and Pro mode seemed to perform poorly. Continuous mode didn't actually capture images as fast as expected, and the Pro mode (manual mode) had fewer options than some other phones in this price range commonly offer. 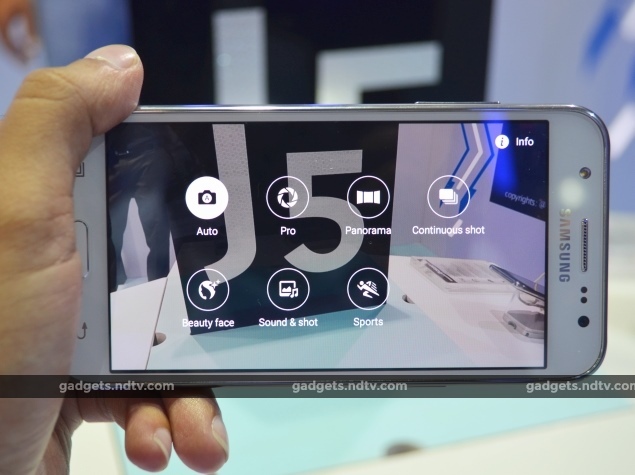 Nonetheless, the cameras overall seemed to be one of the new Galaxy J devices' best features. In our short time with the Galaxy J5 and Galaxy J7, we were not able to test their battery life. However, both should give a decent amount of life as they don't have any power-hungry features such as motion sensors and high-resolution screens. All said and done, the duo might prove to be serious competitors in their respective price brackets when it comes to camera quality. The Galaxy J5 is snappy, runs the latest version of Android, has expandable storage, supports 4G, and features a decent battery - all the things users care about, for under Rs. 12,000. For Rs. 3,000 more, you can get a larger display, better processor, and better battery. Stay tuned for in-depth reviews of both smartphones, coming up soon. product These smartphones might just have the best camera features in their price range.